Lengthy sparring sessions can be tough on your hands, so boxers will often forget that their boxing gloves need to be regularly cleaned in between uses. Dirty gloves left unattended can fester with bacteria and will eventually smell awful. Luckily there are preventative measures you can take to prevent your glove from being overtaken by harmful or otherwise bad-smelling bacteria. There are many different methods and some are tailored to specific glove materials, so it would be a good idea to familiarize with what your glove is made out of before trying any of the following cleaning methods. How to Clean Your Boxing Gloves? One surefire way to kill all the bacteria in your gloves is to soak them in a saline solution (such as saltwater) overnight. The solution will break down and dissolve any bacteria in your gloves, though this method can be dangerous if your glove is made of materials that do not react well to saltwater. Because of this, you should do thorough research before attempting to clean your gloves with saltwater. The saltwater soak is considered a superior alternative to boiling the gloves, as doing so would not only kill the bacteria inside but also damage or destroy the gloves. Another great way to soak up the sweat in your glove is by wrapping your hands in hand wraps. The hand wraps act like a sponge and draw most of the moisture away from the interior padding of your gloves. This method works great but presents a need to clean your bandages regularly, or they in turn will start to fester and stink. One very popular way of preventing micro-organism growth in gloves is to leave them in the freezer for a few days, effectively killing most of the bacteria inside the gloves. While freezing is an excellent option because it can halt the spread of bacteria, it often leaves the gloves covered in ice, resulting in the need to “air out” the gloves for the next several days. To offset this, many have found that placing the gloves in a plastic airtight bag prevents water from soaking the gloves while they are being frozen. This method does not necessarily kill all of the bacteria so much as destroy most of it and leave the rest in a state of hibernation. It would be a good idea to spray the inside and outside of the gloves with either Febreze or Lysol after removing them from the freezer. Any anti-bacterial spray can help prevent bacteria from taking hold in your gloves. A simple spritz of Lysol, Febreze or another high strength anti bacterial spray before and after sparring is enough to keep most bacteria at bay. Obviously this method does not have an 100% success rate, but it does decrease the overall frequency at which you’ll have to clean your gloves. Remember, anti-bacterial sprays differ by brand, so do some thorough research into what works best before buying some for yourself. 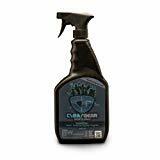 There are some sprays that are specifically designed for sports equipment, such as Clear Gear Disinfecting Spray. I haven’t tried this one myself, but reviews say that it doesn’t irritate the skin, which is really important if you are spraying it inside your gloves. I’ve just recently decided to try one of those shoe dryers that are available on Amazon. 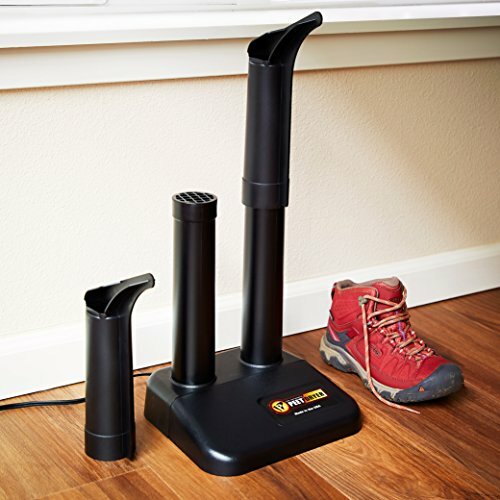 I got myself Peet Boot/Shoe Dryer the one that had the best reviews at that time. And I have to say that it works better than I expected. 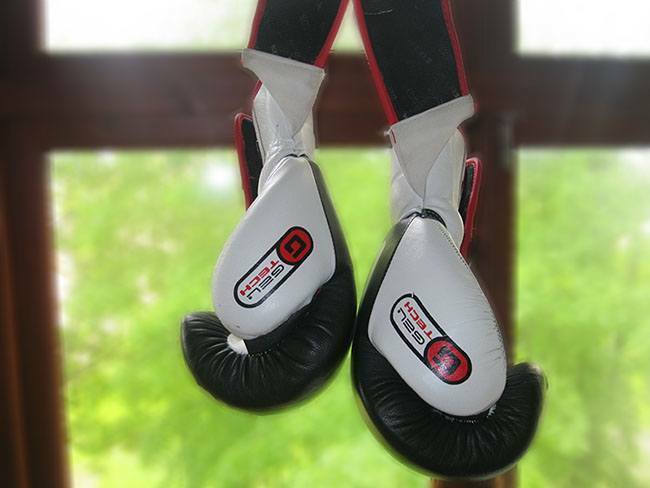 Not only it dries my shoes well, but it also works perfectly with all other boxing equipment, such as boxing shoes. 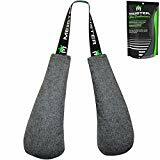 It dries my gear and eliminates the odor from constant use. Just remove the foot attachment and place gloves on the holder. I usually just keep them for 3-5 hours. But some users say that it can easily stay overnight, since it’s a very low heat and makes no sound. Just be careful with cheap synthetic gloves, test them first with shorter drying periods. The methods listed above have the potential to increase the lifespan of your gloves and keep them looking (and smelling) fresh and clean. Here are a few more basic tips that you might want to consider adopting into your routine. First, it’s a great idea keep your gloves at your side or somewhere open after use. Avoid putting gloves in your gym bag after use, as the sweat you built up from the workout will allow bacteria to grow if you leave them in a tight space. Try to air out the gloves as soon as possible, preferably in the sun or under a fan. Don’t be tempted to run the gloves through your washing machine or dryer, as both of these will rip your gloves to shreds. Though there are other methods that can be used to clean boxing gloves, the aforementioned are both the safest and the most popular. Not all methods are safe for all gloves, so something that might work for leather gloves could potentially destroy a pair of polyester gloves. Remember to always use common sense and avoid putting your gloves or yourself at risk. Good luck and keep your gloves dry! Have any questions? Don’t see a method you use listed? Please share it in the comments section!